Continuing from last time the clue was detective and here we are – Detective Conan by Gosho Aoyama. It is more famous in the west by its anime name ‘Case Closed’. Detective Conan is as name suggests a manga about detectives and a Shonen. While I personally feel its themes are slightly Seinen – i.e. above 18 boys/men – that’s because of its mature romantic themes and darker nature of primary antagonists. I will say it is a manga written for boys from point of view of men. Sure it has a refreshing charm and is treated with immense respect in Japan. The biggest testament will be the fact that it was chosen to introduce world summit for G-8 conference of 2008 in front of world leaders – http://www.mofa.go.jp/mofaj/press/pr/pub/pamph/conan_summit.html. It is also winner of prestigious Shogakukan Award in shonen category, 2001. Tokyo Police often run awareness drives for Children with the help of characters from DC. Detective Conan was first published in 1994 in Shogakukan’s Weekly Shonen Sunday. In the late 80s and early 90s, Japanese manga industry, especially Shonen Industry was more or less captured by some of the biggest ever names in manga. It was the era of Dragon Ball, Saint Seiya, YuYu Hakusho and also Sailor Moon. Dragon Ball sure is a legendary manga but it also more or less typified the Shonen genre. It is just like Lord of the Rings creating a template for the fantasy fictions to come. The template was developed by Saint Seiya and YuYu Hakusho which now is being developed further by One Piece. Similarly Sailor Moon did this for Shojo. This resulted in a boom of similar shonens during late 80s. While fortunately the scale of the boom for Shojo was a little less so the trend didn’t change much for girls but boys sure were bored of the template and wanted some change. It didn’t come till One Piece and Hunter X Hunter came so the template was abandoned for some time and authors like Aoyama Sensei were given a chance. Note that it was the same period when we got Kindaichi Case files, Slam Dunk and Captain Tsubasa. Suddenly the approach was more scientific and Conan was a sweet breeze there. Aoyama cites his influences Arsene Lupin, Sherlock Holmes and samurai films of Akira Kurosowa. The combination of all these had to be great. There are 2 plots for Detective Conan – plot of the current case which changes per case; normally one case lasts for 3-4 chapters though there are some long stories as well. And the central plot which is ongoing – it features 17 year old high school detective Shinichi Kudo and his love interest Ran Mouri. Shinichi solves a case in the pilot and during that encounters the mysterious men in black, members of a secret crime syndicate called as ‘The Black Organization’. While he spies on them, he is caught and forced to eat an untested poison which is supposedly untraceable. Instead of killing him, it shrinks him to size of a six year old kid, unknown to the black organization. As per suggestion of his neighbour and friend Dr. Agasa he lives with Ran and her father Mouri Kogoro – jokingly called sleeping kogoro – who is also a private eye under the psuedonym Conan Edogawa – Conan from Sir Arthur Conan Doyle author of Sherlock Holmes and Edogawa from Edogawa Rampo a famous Japanese mystery writer. He continues pursuing men in black. 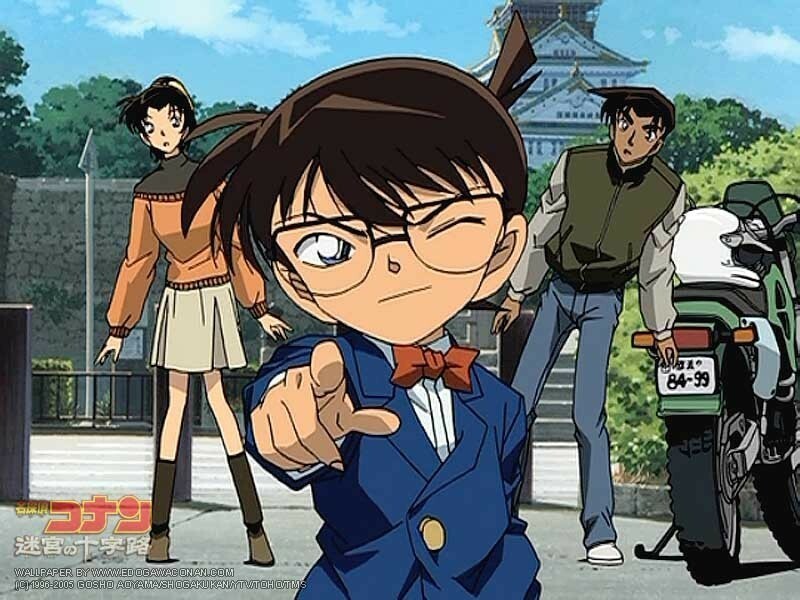 He often collaborates with Hattori Heiji another high school detective to solve cases and now days frequently with Masami Sera who is interested in Conan’s identity. Then there are Detective Boys – Ayumi Yoshida, Genta Kojima, Mitsuhiko Tsuburaya, Ai Haibara – Conan led group of kids from his primary school. While Ai is actually a former agent of black organization and creator of ‘the poison’; she herself is shrunk by the drug and currently working on its antidote. Stories often feature Sonoko Suzuki, best friend of Ran, and her uncle as a source/directive for case. There are lot more love pairs in the story like from the police department Takagi and Sato. Lastly the more important characters are Conan’s parents – Yusaku who is the greatest mystery writer and Yukiko a former actress who sometimes helps Conan with her makeup skills. And Kaito Kid – a phantom thief whom Conan has love/hate relationship with and considers him as the one with whom he can match wits with. Currently Conan is collaborating with FBI against black organization and organization agent Bourbon taking particular interest in Conan. Also FBI agent Shuichi Akai is collaborating with Conan separately under identity of Subaru Okiya after faking his death. Firstly it is a detective manga which tries to keep simple and slowly developing its plot. So there are almost no full colour spreads which you find in other shonens like Naruto or One Piece. This doesn’t meant the art is simple in nature. Gosho draws his scenes with minutest details possible often leaving subtle clues for readers in the scene itself. The artwork is fabulous and I always wonder how does he manage to write a classic Sherlockian mystery and draw it within deadline almost every time. Characters show strong traits from various detectives. In fact Aoyama released a list of detectives he studied/read for his stories. Conan is a classic Holmes-school detective with several traits from Hercule Poirot as well. Ran is a strong female protagonist and the romantic angle between them is developed brilliantly. The other character to write about most is Kogoro – a comical wannabe detective with a surprising, hidden strong side. On antagonist side the one I like most is Amuro code named Bourbon. Amuro is the one who thinks closest to Conan according to me and is going to be tough one for him. In general Aoyama has got most of his central cast assembled and developed well. In fact almost all of his central characters are detailed nicely and have there own personality which is good for the story. The best one is though Kaito Kid. It is a character with its own potential – it lead to a separate manga Magic Kaito. Perfect foil to detective in form of thief. While Conan prefers to have his facts straight Kid prefers to be flashy which annoys Conan. Last one to deserve a special mention is Heiji. Best friend of Conan is pretty much an aggressive version of him. While his romantic angle is visited many times – but his relation with Kazua remains hopeless due to his comical obsession to solve cases while ignoring Kazua totally. There is lot more to write about here but then you will be given spoilers which I want to avoid. Detective Conan is a manga for detective fans. It is a path breaking manga as it changed the ‘noir’ nature of Japanese mystery and brought the Sherlock element to it. While some people may not prefer the addition of romance and so many romantic angles in the story, they definitely do not make the matter worse. It still remains a largely enjoyable manga. It is highly recommended for kids despite the romance as it garners a positive influence and kids should read good comics which are suitable for their age. While adults can also find it good especially those who are fans of the mystery genre. While some of the stories may not make the cut but most of them will. The cons will be romantic themes for mystery purites. Also one more con can be the requirement of knowledge of Japanese culture and language. While Aoyama does his best to explain the solution, sometimes non-Japanese find it extremely difficult to appreciate or understand the solution. Especially when it includes some sort of code derived from Kanji letters. Otherwise you should have no complaints. Hey you – guess what I am a must read!! After reading so much one must have guessed what I would say. It without any doubt is a legendary manga and a must read. It has a bit of everything for everyone, not much going against it. It is beautifully written, drawn and that sums up the case. My rating would be 86.5/100 – a must read for everyone and definitely one of the best shonens.